An Education (2010) is a coming-of-age film based upon a memoir by British journalist Lynn Barbour, with a screenplay by Nick Hornby. A British schoolgirl, Jenny Mellor (played by Carey Mulligan) accepts a lift home from school from an older man, David Goldman, played by Peter Sarsgaard. The year is 1961, and the girl feels hemmed in by middle-class rules. She is afraid that the world is passing her by, until the charming man in the car offers her glamor and romance. She accepts his offer, and receives an education: to say much more would spoil any surprise the viewer might find in this film. The film won 18 awards out of 48 nominations, including 3 Oscar nominations, and it was critically well-received. Jenny’s response? She prefers to spend his money and live glamorously than to do the boring work of study, and she insolently suggests the headmistress prepare better for the next time a girl wants to know why she should get an education. The casual viewer might see the film and say, as many have, that David’s Jewishness is incidental to the film, or merely an opportunity to display the narrow-mindedness of the conventional middle-class British mindset of 1961. Indeed, the screenwriter has said that the character is Jewish only because the real con man in the memoir was Jewish. However, as the Lynn Barber observes in an interview about the process of making a her memoir into a film, a lot of other details were changed on the way from one medium to another, so it seems quite fair to ask: why is this detail left in place? This points us towards a question of a much deeper, more pervasive anti-Semitism in the film, an issue originally raised in an article in the Jewish Journal. David fits many of the ugliest stereotypes purveyed by anti-Semites, indeed, precisely the attributes of the Wandering Jew cited in the beginning of the film. He is an urban and urbane character, at home in the fashionable salons about town. He makes his money by speculating on property values in middle-class white neighborhoods he deliberately devalues by importing black residents; he is an art speculator and a petty thief. When challenged by Jenny about his thievery, he justifies his crimes by citing his lack of opportunity, “We’re not clever like you.” He eventually emerges as having made a hobby out of the ruin of nice English girls. In short, he is the personification of the parasitical Jew in Der Erwige Juden (The Eternal Jew, 1940). In fact, “Der Erwige Juden” is the German name for the figure of The Wandering Jew. I confess I did not see this on my first viewing of the film, but upon reflection, it is all there and it’s quite nasty, whatever the intent or non-intent of the filmmakers. I was not certain of it until I stumbled across a review of the film by a prominent anti-Semite, who writes that the film is a parable about the seduction of young people’s minds and souls by evil Jews. I’m not going to cite or link that particular item, because I prefer not to give such garbage additional press. My point is that whatever the filmmakers did or did not intend, this film contains certain specific tropes regarding Jews that act as a magnet for a certain type of deranged person. I wish they had left out the “Wandering Jew” business, and if it is not essential to the film that he’s Jewish, then why make a point of it? The Anti Defamation League has gone on record saying that they don’t think harm was intended. After reading interviews with the filmmakers and the memoirist, I tend to agree. However, I think that the meme of the Wandering Jew is strong stuff that a filmmaker should use only in a very intentional manner, and that this film is fodder for haters. This entry was posted in United Kingdom and tagged Anti-Semitism, Drama, Feminist, Racism. Bookmark the permalink. The Film An Education: Anti-Semitic or Just the Facts? 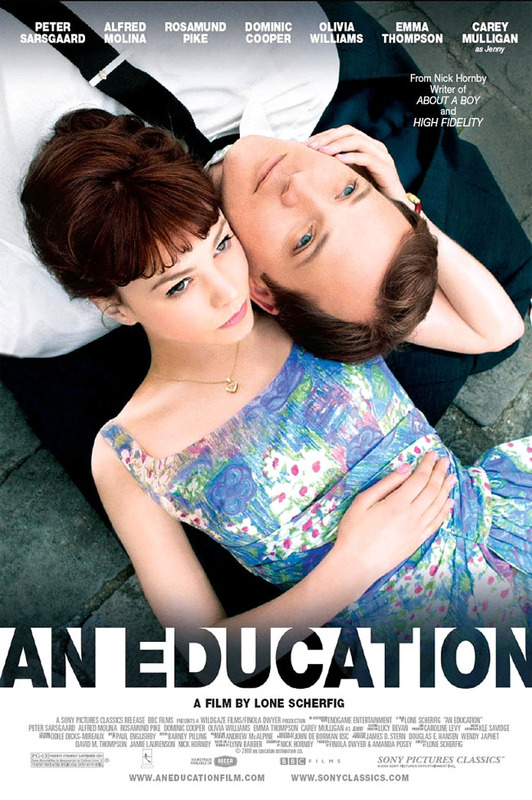 The British film “An Education” is an artful and engaging coming of age story based on a memoir. Why are we promptly told that one of the main characters is Jewish (with familiar stereotypes) when his religion adds nothing to the plot? I absolutely agree: that’s the question. As you point out in your article, the wide distribution of this film means that this pernicious image will travel far. I’ve made myself a note to take a fresh look at High Fidelity and About a Boy (other Nick Hornby films) to see if there are Jews in those films, and how they are depicted. I don’t recall any, but it has been a while. Thank you so much for reading; I invite your comment on other commentaries on this site. Hi, I recently saw this film and thought it was fairly enjoyable, and yet kind of awkward. The obvious main thing for me was the age difference which is really hard to accept. One would think that the father of the young girl would want to know everything about this new, much older man in his daughter’s life. Religion seems to be a very important part of one’s personality, so therefore I respectfully think that you are wrong, and the father finding out that this man is jewish (which he was in real life) is an element that deserves a spot in this film. We come to find out that the male lead is not ‘the greatest guy on earth’, but I don’t think it’s a reason to get bent out of shape just because he also happens to be of a certain race and religion. There are movies featuring all religions with less-than-desirable characters that are taken by the viewer for what they are…characters in a movie, good or bad, that happen to be of a certain religion. The movie ends and we go back to real life. I guess I don’t quite understand why jewish people get so bent out of shape over certain movies that depict them in a less than favorable light, while at the same time there are very many jewish directors and producers who make muslims look like the worst people in the world…but yet we never hear jewish people speaking out so vehemently about that? I think some people need to grow thicker skin. My husband and I watched this film last night (2017). We both had the same reaction: that the sub-text that drives the story-telling is anti-semitism. The villainous older man is a stereotype. My husband is the son of a holocaust survivor and was brought up as a Christian; I am nominally Christian. We do not need to grow a thicker skin. We already have that. What we do have is a sense of when something is “off”. “An Education” is off in multiple ways. That the father does not realize that the man is too old for his daughter is pathological, but the film merely portrays him as provincial and tightly middle class. That the mother is beautiful and the father is not makes no sense. That both parents are attracted to the villain makes sense, but no self-knowledge comes of it. That the girl, who apparently has never had a boyfriend, is given so much freedom makes no sense. That the man has had numerous of these affairs makes him a sexual predator, but the only way we are made aware of his danger is through the riffs on anti-semitism, so well described above. That there is a possibility the villain is sexually “off” is not explored, nor is the fact that neither Sarsgaard or the wife do not appear to be old enough to have had that many affairs since his marriage. The primary way it is “off”, however, is that there is a British tweak to the anti-semitism, a whiff of Dickens’ Fagin. I admired “High Fidelity”. I do not admire this. The only word that properly decribes this film is sophomoric, as in sophomores don’t generally realize when they are playing with fire to get their effects. Carrie Mulligan is beautiful and charming. I wish she had not made this particular film. Nick Hornsby can also be very entertaining and charming, but I wish he hadn’t made this film. Just a note on who I am: I contribute to Trevor Barrett’s literary blog, where I write primarily, now, on Alice Munro.